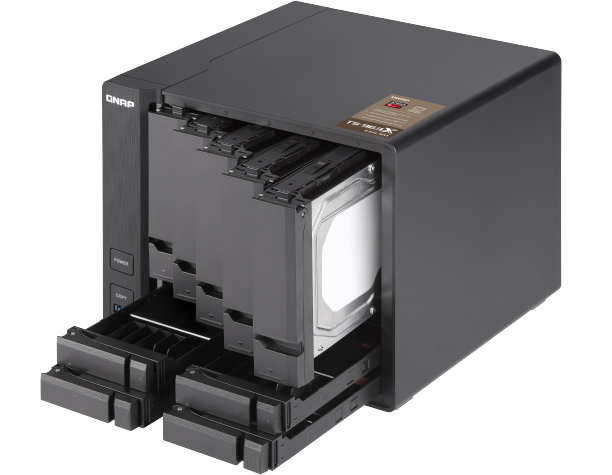 QNAP this week has taken the wraps off of their new 9-bay NAS family, the TS-963X series. The new storage devices sports a mix of 3.5-inch and 2.5-inch drive bays with support for the company’s Qtier file/data tiering technology, and also features integrated 10GBASE-T connectivity. 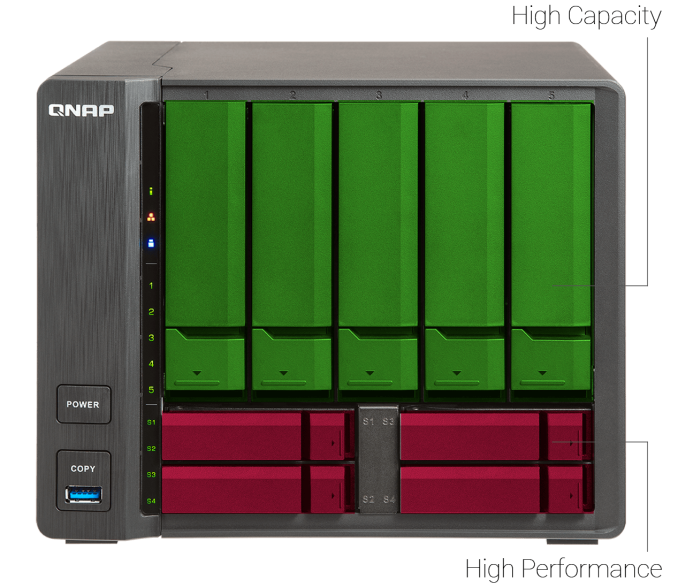 Being the first 10GbE-enabled NAS in its class, the QNAP TS-963X products are primarily aimed at small businesses that need high capacity and fast access time. The QNAP TS-963X NAS features five hot-swappable 3.5-inch bays for high-capacity SATA HDDs as well as four hot-swappable 2.5-inch bays for high-performance SATA SSDs or HDDs (keep in mind that the latter may be hard to find). The NAS is based on AMD’s GX-420MC SoC (two Excavator modules, 2 GHz, 2 MB L2 cache, Radeon iGPU with 128 stream processors, a 256-bit AES encryption engine, 17.5 W TDP) and run QNAP’s QTS 4.3 operating system. The latter supports various features, including snapshots, virtual JBOD, Qsync cross-platform file sharing (for Apple, Windows, and Linux machines), one touch copy as well as Qtier technology that automatically organizes frequently used file/data into tiers (by moving frequently used data to SSDs). The QTS 4.3 can also support various first-party and third-party apps that can further enhance functionality of the QNAP TS-963X. For example, the Hybrid Backup Sync can synchronize files with local, remote, and cloud storage; the QVR Pro offers features required by a surveillance solution; whereas Virtualization Station enables users to host virtual Windows/Linux/Unix machines on a NAS (the TS-963X is VMware as well as Citrix ready, and is Windows Server certified). One of the key features of the QNAP TS-963X NAS is integrated 10GBASE-T network card that supports 10 GbE, 5 GbE, 2.5 GbE, 1 GbE, and 100 MbE speeds. The TS-963X is one of the first NAS for small businesses to feature 10 GbE and multi-gig connectivity over an RJ45 connector using Cat5e/Cat6 cabling. As 10GBase-T and NBase-T networks become more widespread, 10 GbE NICs inside SMB-oriented NASes will become more widespread, but for now the TS-963X will offer this feature exclusively. QNAP’s NAS uses Aquantia’s relatively affordable AQtion AQC107 network chip, so the capability does not necessarily increase its pricing significantly. QNAP says that the TS-963X will be available shortly in two versions: the TS-963X-2G with 2 GB DDR3L memory as well as the TS-963X-8G with 8 GB of DDR3L memory. The manufacturer yet has to disclose pricing of its new NAS, but it says that the TS-963X will carry a “budget-friendly” MSRP. Other I/O Copy button, buzzer, LED notifications, etc. Dimensions Height 182 mm | 7.17"
Width 225 mm | 8.86"
Depth 224 mm | 8.82"
Seems quite simple why if you think about it, AMD probably has a boatload of these chips around and a need to get rid of them. Heat and power is not much a problem because there aren't many very CPU intensive tasks to do her. lol base garbage reply and commented by another garbage reply. why AMD soc? oh dear really you think it all needs to be intel to be good? Actually the socs from AMD do pretty well in these markets due to there much better graphical performance while single thread CPU power is not the focus of these markets.